To celebrate LGBT History month I’ve asked writers, historians and scientists to write about interesting queer people who now reside in our cemeteries and crematoriums. Although Harvey Milk knew he was gay in high school — where he sang in the opera and played football — he followed in his parents’ footsteps and joined the United States Navy in 1951. Milk served as chief petty officer aboard the USS Kittiwake during the Korean War. When the Navy questioned Milk’s sexuality, he was given the chance to resign and received an honorable discharge. Milk campaigned for conservative Republican presidential candidate Barry Goldwater in 1964 before bouncing between careers as a financial analyst, high school mathematics teacher, and production assistant on the Broadway musicals Hair and Jesus Christ Superstar. In 1972, Milk moved to San Francisco, California with his lover Scott Smith. When they opened a camera shop in the city’s Castro neighborhood, they discovered the local business owners’ association did not welcome gay men. Milk and Smith joined with a local hardware shop to unite predominately LGBT businesses as the Castro Village Association. Milk served as its first president. The success of the association’s initial Castro Street Fair in 1974 inspired similar celebrations in other LGBT communities across the US. Milk made several unsuccessful bids for San Francisco City Supervisor before being named by Mayor George Moscone to the Board of Permit Appeals. Milk was the first openly gay city commissioner in America. In November 1977, Harvey Milk was elected as a City Supervisor. When he took office the following January, he became one of the first openly gay elected officials in the United States. Photo: Terry Schmitt, San Francisco Chronicle. While in office, Milk sponsored a civil rights bill that outlawed discrimination based on sexual orientation in employment, housing, and public accommodations in San Francisco. He worked to establish day care centers for working mothers, convert unused military facilities into low-cost housing, and advocated for strong, safe neighborhoods. Milk was only getting started when a disgruntled ex-colleague assassinated him. Former City Supervisor Dan White smuggled a gun past San Francisco’s City Hall metal detectors by creeping in through a basement window on November 27, 1978. He went first to the mayor’s office to ask for his job as supervisor back. When the mayor refused, White shot Moscone five times, including twice in the back of the head. White let himself into his former office, reloaded his gun, then entered Harvey Milk’s office, and murdered Milk at his desk. Following a silent candlelight march from the Castro to City Hall, the bodies of Supervisor Milk and Mayor Moscone lay in state in the City Hall Rotunda. More than 10,000 mourners filed past their caskets. Milk’s funeral was held at Temple Emmanue-El, followed by a celebration of his life at the War Memorial Opera House. After Milk’s cremation, his ashes were divided. The greater portion of them were mixed with two packets of grape Kool-Aid (a dehydrated children’s drink), then wrapped in Doonesbury and Peanuts comics strips. On December 2, 1978, Milk’s close friends and former lovers scattered his ashes from a sailboat in San Francisco Bay. The Kool-Aid turned the water purple. In October 1987, former US Air Force Sergeant Leonard Matlovich (a decorated soldier discharged for being gay) brought a small urn filled with Harvey Milk memorabilia assembled by Scott Smith to the Congressional Cemetery in Washington, DC. Matlovich intended to found a shrine inside the Congressional Cemetery to honor leaders of the Gay Rights movement. The urn contained a lock of Milk’s ponytail, a rainbow flag, and a cassette recording of one of his speeches. It was believed to also contain some of Milk’s ashes, but that was eventually disproven. A double gravesite was purchased in Milk’s name and a memorial service held featuring the urn. However, nothing more came of the project until April 1993, when Ken McPherson unveiled plans for an elaborate memorial in Milk’s honor to be located across the street from Matlovich’s gravestone. In 1999, a standard Veterans Administration headstone was ordered for Milk, in honor of the years he served in the US Navy, but it was either never placed or has been stolen. The cemetery had no record of it in 2008, when its new executive director discovered the urn full of mementos in the cemetery’s vault. It was returned to Milk’s nephew Stuart Milk — also a gay activist — in 2009. In the late 1990s, a small portion of Milk’s ashes were mixed into the cement sidewalk in front of 575 Castro. A bronze plaque marking the spot reads, “Harvey Milk made history as the first openly gay elected official in California and one of the first in the nation, when he was elected to the San Francisco Board of Supervisors in November 1977. His camera store and campaign headquarters at 575 Castro Street and his apartment upstairs were centers of community activism for a wide range of human rights, environmental, labor, and neighborhood issues. 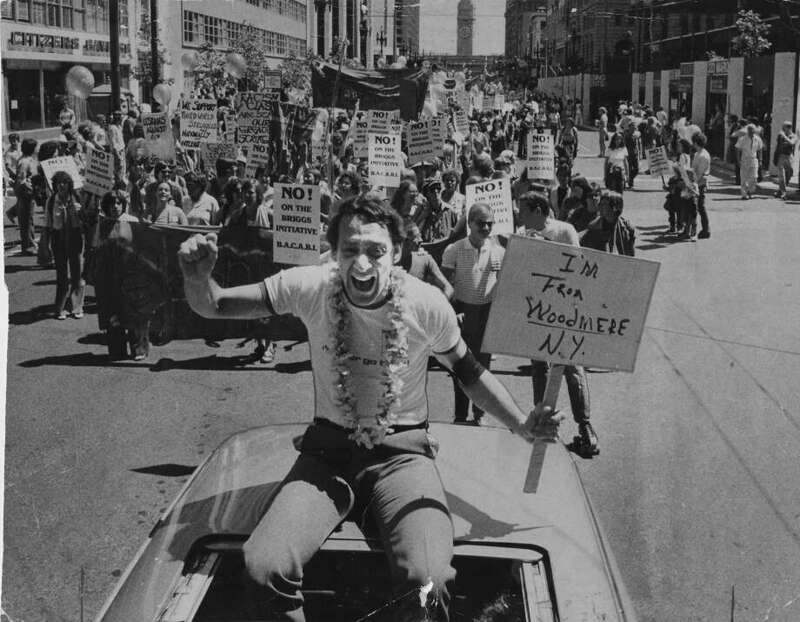 Harvey Milk’s hard work and accomplishments on behalf of all San Franciscans earned him widespread respect and support. His life is an inspiration to all people committed to equal opportunity and an end to bigotry. Across town, the historic San Francisco Columbarium has a niche in Milk’s honor. For years, mementos were displayed in a niche high overhead, but in 2015, they were upgraded to a larger niche at eye level. On display are a photo of Milk with Scott Smith, campaign buttons, and an envelope with the stamp issued in Milk’s honor by the US Postal Service on his birthday in 2014. LGBT in a Cemetery – what stories do you have? If you’d like to contribute a blog post, let me know! Thank you! I learned so much writing this piece. PreviousWhat Becomes of Us After Death?